Losing a phone is nothing short of a nightmare. Besides the monetary setback, it is also an emotional blow. At an instant you lose all your contacts, photographs, SMS and more. The situation becomes worse if you have a smartphone. Smartphones often store email passwords, Facebook and twitter login details, credit card numbers and other sensitive information. Losing one can be a major privacy and security nightmare.This is where an anti-theft tool like WaveSecure comes in. Improving Your Phone’s Security: WaveSecure has something called an Action Center. This is actually quite similar to the Windows Action center. It simply suggests and recommends changes you can make to your phone’s settings to improve security. Backing up Your Data: WaveSecure can automatically backup critical information including your contacts, SMS and Call log. 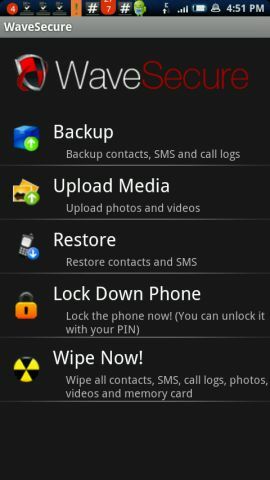 You can also manually backup pictures taken using your phone. This comes in handy, not only if you lose your phone, but also after flashing your handset (or performing a firmware upgrade). Protecting Your Privacy: If you detect that your phone has been lost or stolen, you can instantly log on to the website or send an SMS to lock the handset. Additionally, you can also perform a remote wipe to remove any sensitive information stored on the handset. Stuff you can wipe includes contacts, SMS, calendar, photos, videos, call logs and even your entire memory card. Tracking Your Phone: On a locked handset, WaveSecure blasts out a particularly annoying and loud alarm that is accompanied by a custom message. This can assist you in locating a misplaced phone, and even scare off a potential thief. 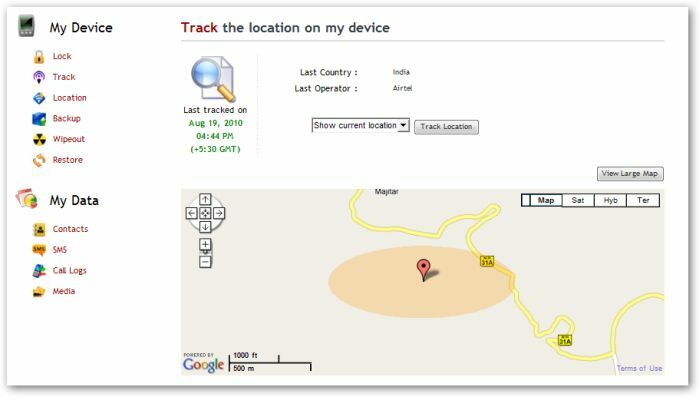 Additionally, you can go online and track your phone. If you have a GPS enabled device, then the location displayed will be fairly accurate. Otherwise, WaveSecure will try its best to estimate the location based on the cell phone tower being used by the handset. You can also configure WaveSecure to automatically lock the handset on detecting a SIM change. Once a handset has been locked, whenever the thief changes the SIM, pre-selected contacts (friends/family members) will automatically be notified of the new phone number. Moreover, the backup feature mentioned earlier, can also come in handy, as it allows a simple way to snoop on your phone’s new owner by monitoring all calls and SMSs. Circumventing the security measures put in place by WaveSecure is quite tough. While on Windows Mobile and Symbian handsets, Wave Secure cannot be uninstalled without the secure PIN, any attempt to uninstall WaveSecure on Android will automatically lock the handset. If you have a rooted device, you can also ensure that WaveSecure cannot be removed even through a factory reset. However, there is one major chink in WaveSecure’s armour. If the thief manages to kill the WaveSecure background process (using a task manager/task killer) before the device has been locked, then WaveSecure won’t be able to offer any protection. WaveSecure was the first app I purchased after getting my Xperia X10i. At $ 19.90 per year, WaveSecure might be more expensive that most apps; however, it is also one of the few apps that I won’t hesitate to term as “a must have”. Although, in this write-up I have essentially reviewed WaveSecure for Android, it is also available for Windows Mobile, Symbian and Blackberry. In fact, a free Java edition with limited feature set is also available. The functionality supported by WaveSecure on the former three platforms is similar to that offered on Android. Nevertheless, you are encouraged to download the 7 day trial version and give it a spin for free. You can also blog about this contest to get an additional entry. Once again, you must leave a comment with the URL of the blogpost. The contest is open to everyone and will close on August 28, 2010 at 12:00 IST. * In case of dispute, all decisions made by me shall be final. Thanks for participating. You just earned 2 spots in the lucky draw. Btw, keep in mind that you can only earn up to 1 bonus point / twitter account. This is a promising app. Great article.I just purchased it, Wave Secure is an very good app that takes care of all the basic or functionalites and improve’s phone security. When I installed Cyanogen 5.0.8 on my NexusOne, WaveSecure came pre-installed with the demo expired somehow. Looking at how obsessed I am with my phone, I would really like to try this out. LOL. Don’t worry. I don’t share the subscriber email addresses with anyone. They are solely utilised for delivering new articles (sort of RSS via email). Nice giveaway and a useful app. could use it for my android phone. Rt’d and subscribed to the blog. I’ve also subscribed to your newsletter. very nice application. Hope i will finally be able to retain my phone without loosing it. Awesome write up and APP, hope I win a license, it is definitely worth the purchase though. Great post huh? This one is really good. Nice information on mobile anti-theft software. Thanks for sharing this useful information. the track feature looks awesome , with the map interface , cool … its s must for high end phones … 1000 INC a year sounds a bit expensive …. The App looks pretty good, I like all the functionality it provides, plus a trial to boot! $20 for one year is not that bad either especially considering all the functions you get. It seems like wavesecure improves your operations with the security. This is am interesting . 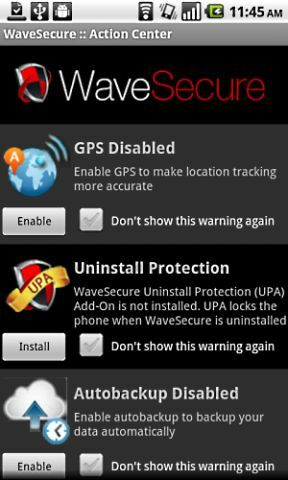 Can I have link to installed n my mobile this WaveSecure software. I want to more advantages from using this application ? 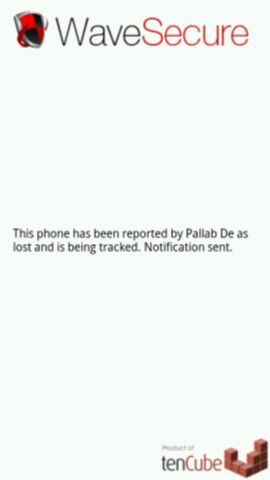 This is a great piece of software, I had to use it just the other day to locate my lost phone. Hi…Thanks for sharing such a brilliant and award winning mobile application. I have a smart phone which is based on android operating system and glad to hear that this app is supported on it. I would like to go for it because i want to protect my important information and other data from being infected with any type of theft. That’s cool. I have an app I use right now but have never had to test it. I will check this one out to see how they compare.